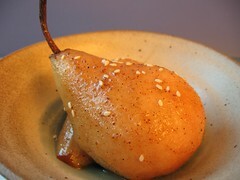 Five-Spice Roasted Pears with Sesame Seeds - Do You Know The Muffin Man? Notes: The Bosc pears I used were a little underripe so they were still a bit firm after I roasted them. The five-spice powder is subtle and the sesame is plain weird. I'll stick with poached pears which infuse and soften the fruit much better.